Flat plate – each panel is typically 2-3m2 panels with flat-glazing which can be mounted either on, or in, a roof. PV powered pumps are available with flat plate systems to reduce the need for power from the grid. Evacuated tubes – comprising a number of “vacuum tubes” fixed into a manifold mounted onto a roof. Highly insulated pipes are routed from the collector(s) to either the existing, or new, hot water cylinder. 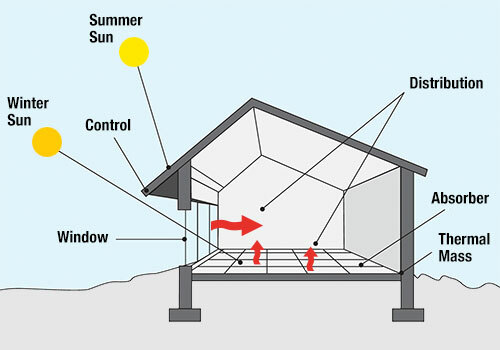 Cold water from the bottom of the insulated hot water cylinder is then pumped thorough the solar collector where it is heated before flowing into the top of the hot water store. Solar heating systems currently qualify for financial help from the government under the ‘Renewable Heating Incentive Scheme’ – this gives you money in return for using renewable energy to heat your home. Unfortunately the government has recently cut this tariff which reduces the incentive to purchase a system. Provide heat for underfloor warm air heating systems. 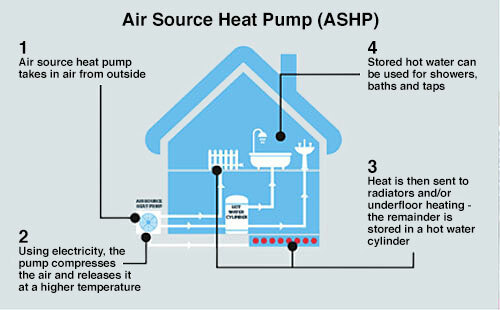 Heat hot water in your home. 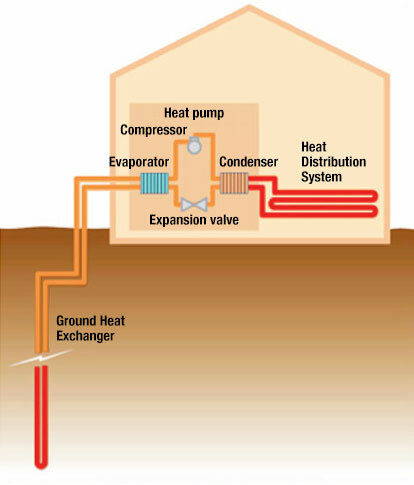 In comparison to ground source heat pumps they are easy to install. Provide heat for underfloor heating systems. To warm air which is circulated using fans. Wood is often used as an additional or secondary fuel in a home – either burnt in a solid fuel stove or a traditional open fire heating one room at a time. 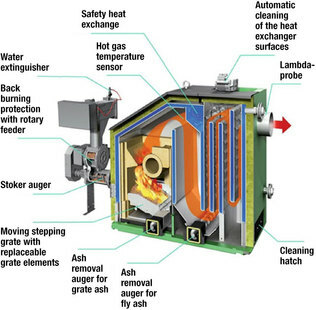 Alternatively, you can invest in a large biomass boiler, connect it with the hot water tank and radiators and use it for centralised heating. Wood chip is also available for use in domestic boilers, where an auto-feed facility can provide heat lasting for a few hours. Biomass as a fuel consists mainly of wood. Wood is a low energy density fuel – which means there is less energy from a greater quantity – so a lot of storage space is needed if you have a biomass boiler.